Greenlands Farm has a barn annexe across the courtyard which has been converted into self catering accommodation for two people. 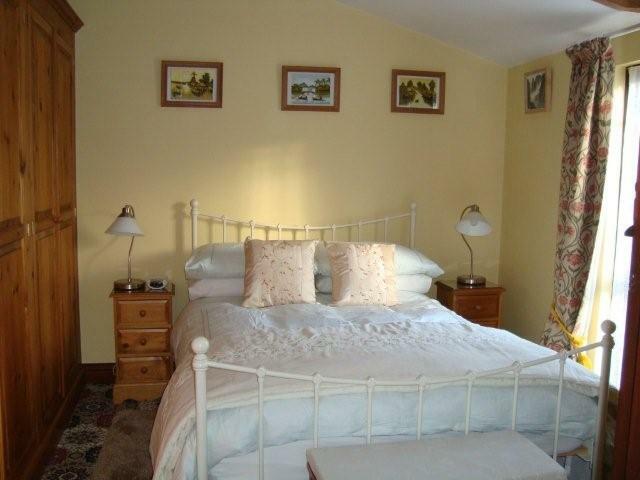 The barn is comfortably furnished and is heavily beamed throughout. It is fully centrally heated. All the accommodation is on the ground floor. The barn overlooks a courtyard on one side, and on the other side it is approached by a private drive where there is ample off road parking space. 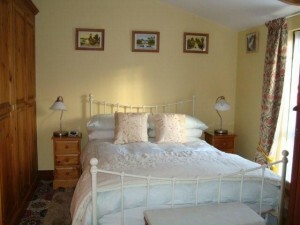 It is surrounded by lovely gardens with open aspects to fields and woodland. Guests are welcome to enjoy the peace and quiet of this beautiful area. Garden furniture is provided. The barn from the garden. The large lounge is a magnificent room with beams and a vaulted ceiling. The lounge is comfortably furnished. There is a flat screen television with Freeview, a DVD player and a radio with a CD player. Free Wi Fi is available. The dining area is part of the large L shaped lounge diner with a pine table and four chairs. The kitchen is fully fitted with an oven, microwave, fridge freezer, washing machine, dishwasher, iron, ironing board and all cooking and eating utensils. A complimentary welcome pack is provided and included in the tariff. This usually includes tea, coffee, cereals, milk, sugar, butter, eggs, orange juice, bread, biscuits, cake and fresh fruit, usually enough for the first day. If you require any shopping prior to your visit, please let us know in advance and it can be arranged. Bed linen, towels and kitchen linen are provided, together with an electric blanket when required.